For merch deserving of the most die-hard White Elephants fans, you've come to the right place! Imagine yourself the proprietor of an Oakland brownstone where all the locals come to discuss their beloved A's. With this custom Oakland Athletics Personalized MLB Framed Pub Sign, your dream can be a reality (sort of). Just let us know the name or nickname you want on the marquee; your personalized A's sports decor will be delivered to your door ready to hang. 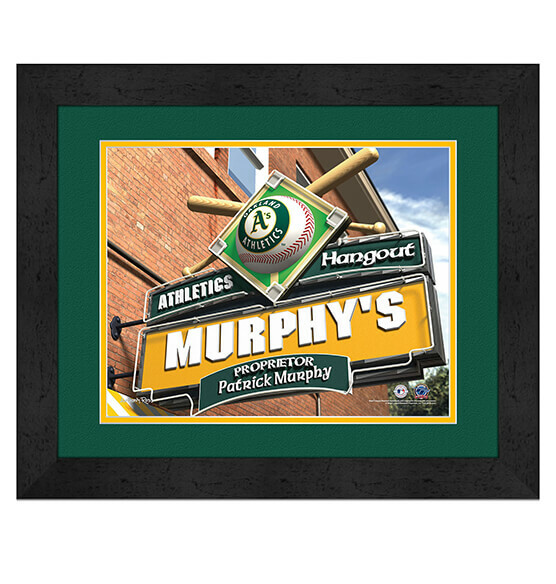 Featuring MDF vinyl-wrapped frame, brilliant team colors, logos and glass, this personalized pub sign is perfect to buy as a good-luck addition to your fan zone or as a gift that any A's fan will cherish!